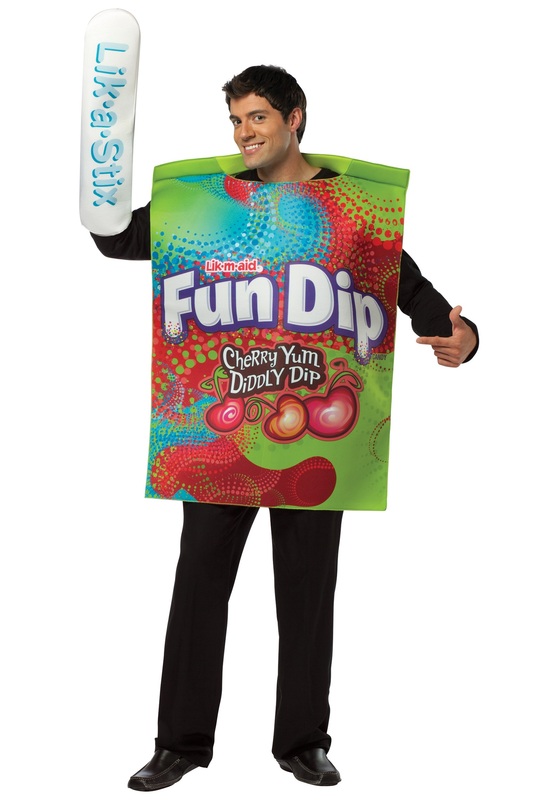 When people see you wearing this Mens Fun Dip Costume, their initial reaction might be that you seem really sweet. But after that first impression, the more complex flavors of your personality really start to come through! After all, Fun Dip isn't like so many other confections. It requires patience, coordination, and a tolerance for sticky fingers. To get the full effect, you've got to coat the Lik-A-Stix with just the right amount of Yum Diddly Dip, and savor every flavorful mouthful. It's a candy that lets everybody know that you're willing to put in the time for a little extra pleasure. It's a treat for people who appreciate the finer things! Then again, you can get a quick buzz by dumping the whole packet of sugary powder in your mouth and chomping down on the stick—so it's versatile, just like you! Hey, people don't always have time for a leisurely joy ride down the avenue: sometimes they're in a hurry! But Fun Dip will get them where they want to be, no matter what their schedule. And so will a Lamborghini! According to our calculations, that makes Fun Dip the Lamborghini of snacks. By extension, this outfit is essentially a Mens Lamborghini Of Snacks Costume. And everybody wants to be pals with the guy whose wrapper doubles as a high-performance luxury automobile! So for best results, we recommend using that phrase whenever possible to describe this playful outfit inspired by a classic treat.